For spring break, we decided to get some culture and head to the city. 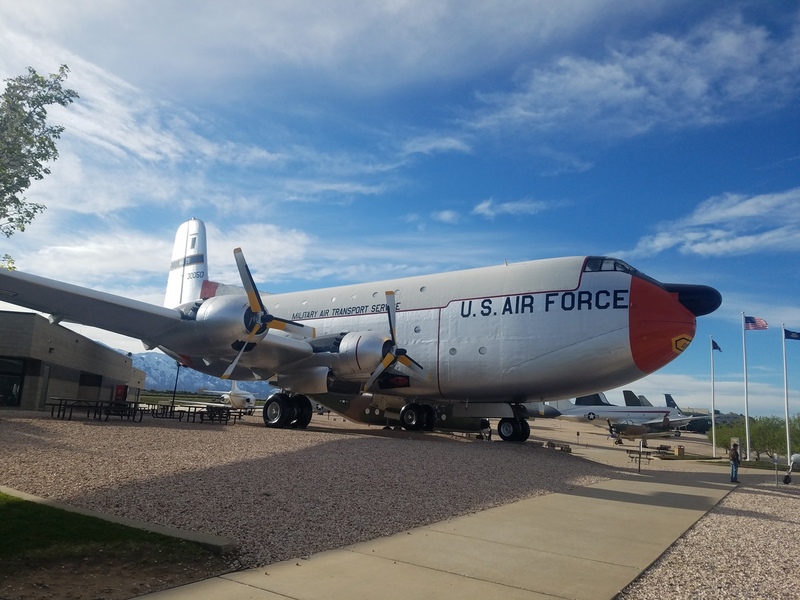 A few years ago we got the Visit Salt Lake Connect Pass, a pass that lets you visit a bunch of attractions for over 50% off. The kids didn't remember a lot from that time (it was four years ago), so I decided it was time to do it again. I found the pass was even cheaper on Groupon. I got the 365-day pass so we have a whole year to visit 16 attractions. The kids wanted to start with the Museum of Natural Curiosity at Thanksgiving Point. 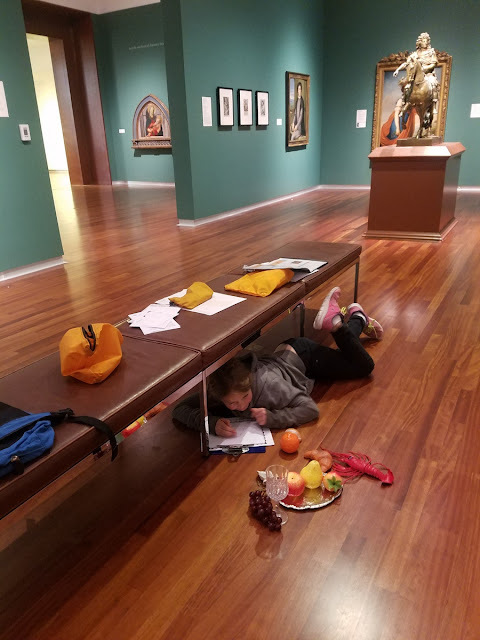 They had been there before for a school field trip and loved it. 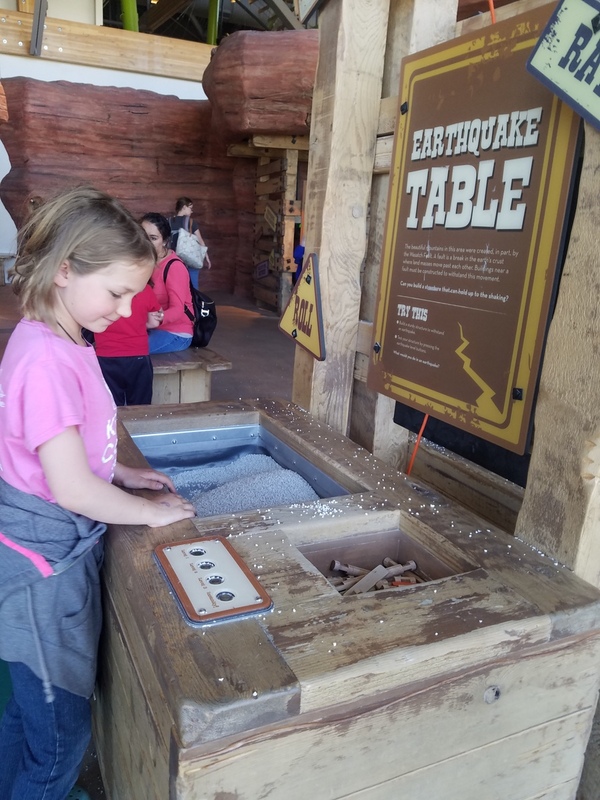 I was glad to see they paid some attention to earthquakes. The Wasatch Front has major faults running along it. 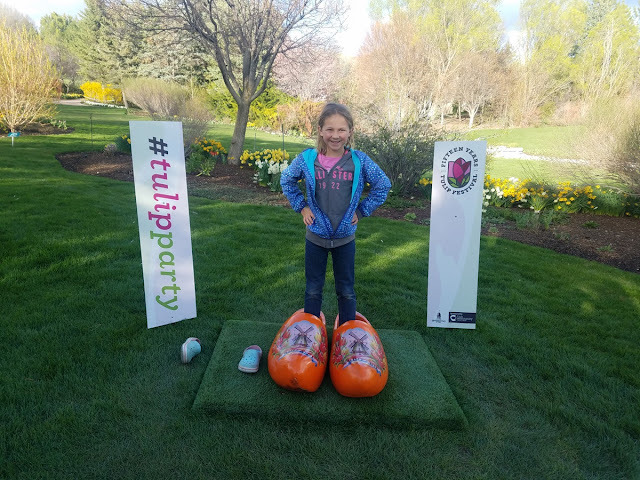 The kids had all sorts of fun doing a variety of activities. I consider it a beefed up playground, so didn't get a lot out of it, but they were happy. 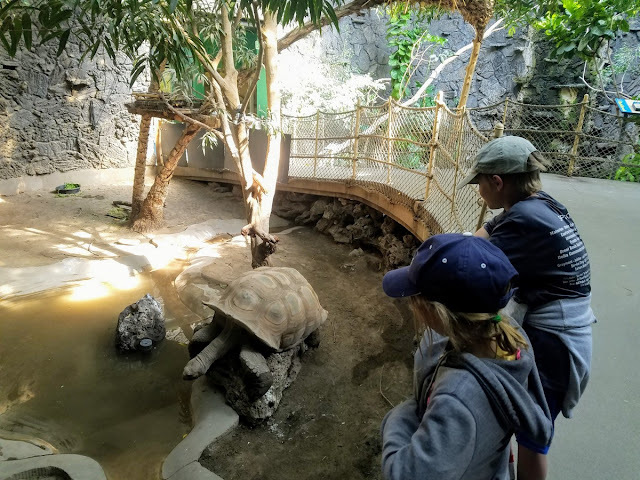 Regular admission is $20(adults)/$15(kids), not what I would pay for a single visit. After dinner, we went to Ashton Gardens at Thanksgiving Point, which was sporting the Tulip Festival. 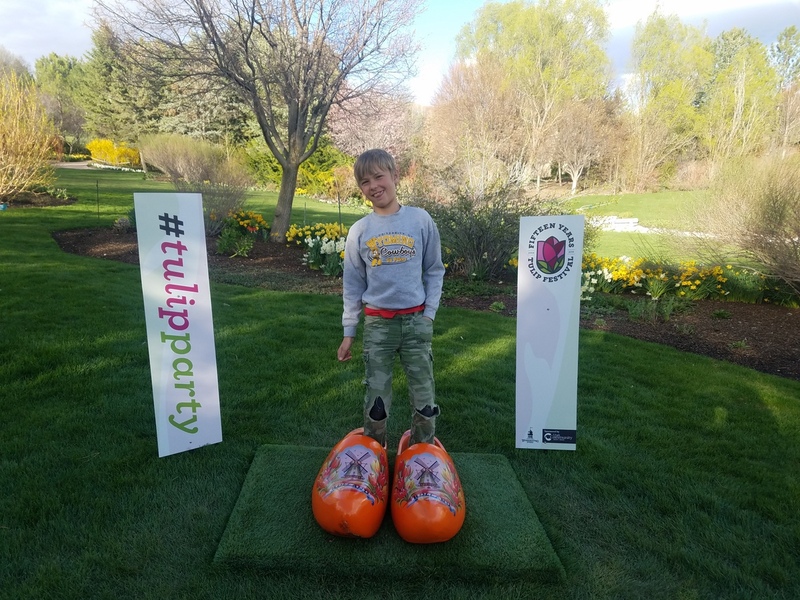 Although tulips are often associated with the Netherlands (Holland), hence the wooden clogs, they got the tulips from Turkey. 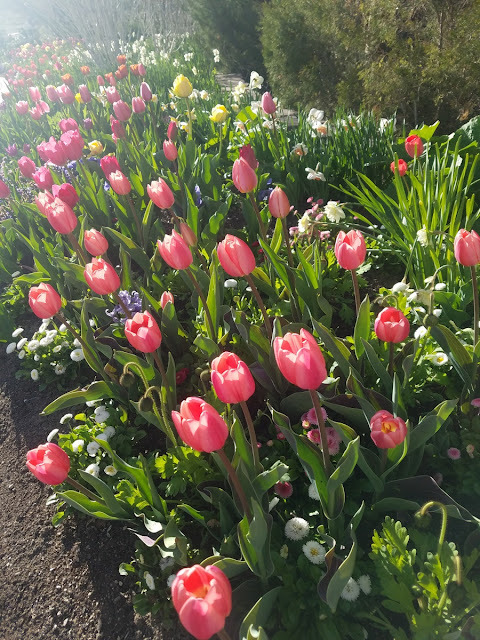 The tulips were beautiful, but it seemed that fewer than half were blooming, despite being more than a week into the festival. I think the cold spring had things a little late. 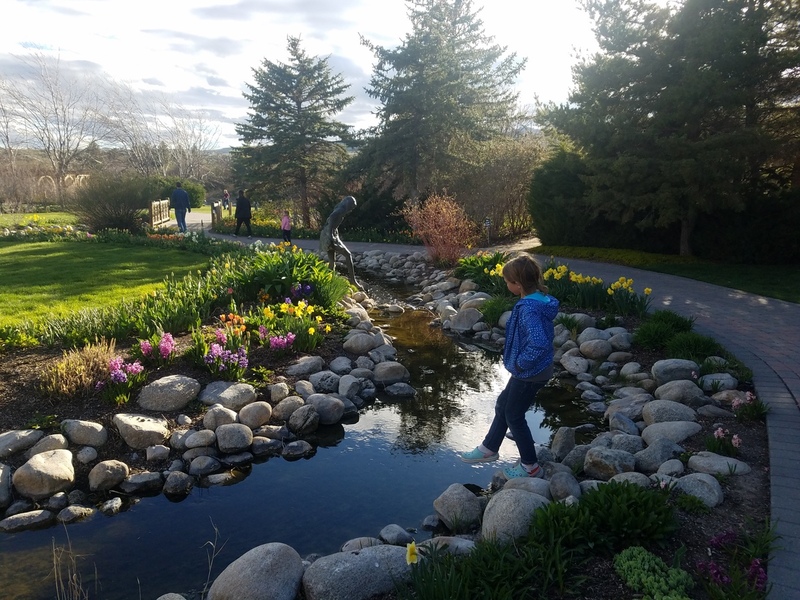 We enjoyed our time wandering around the gardens, which were quite busy during the golden hour. 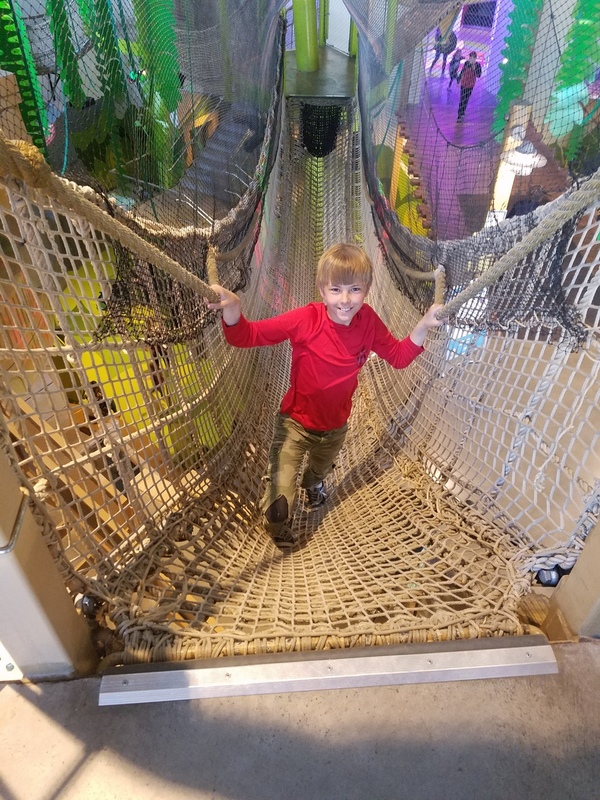 The regular ticket price is a whopping $25(adults)/$20(kids), so we wouldn't have visited except with the Connect Pass. Here Desert Girl mimics the pose of a statue. I really liked the lines of this portico. More pretty parts. You can see that the tulips at the top were blooming, but not the ones at the bottom. We had four full days for our spring break trip. Originally I had planned to do four days of museums. Then I decided that was a little too much for my sanity. Why not spend a day skiing? So we went up Big Cottonwood Canyon to Brighton Ski Resort. It was one of the few places left in Utah open in mid-April. It had the added advantage of kids 10 and under ski free and good deals on online tickets. Ski rentals were also cheap ($20 for kids). So we figured out a plan for the day. The views were absolutely amazing. We went on every lift (except the super short one) at least once. The kids' favorite time was when we were going down a blue ungroomed run. 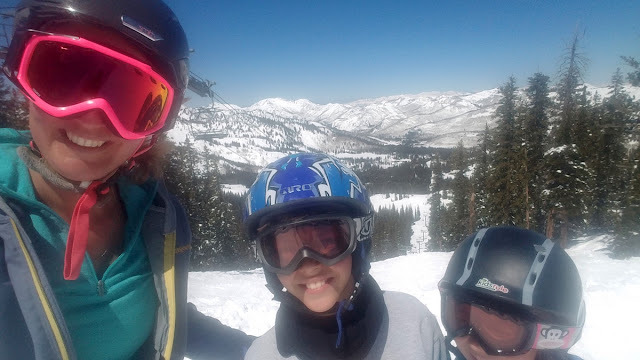 It got kind of steep for me, so instead of leading I had the kids go ahead, as they ski better than me. They watched me crash my way down the slope. Later we learned that we had missed a turn (the runs were not well marked) and we had ended up on a black run! Oops! The snow was good in the morning, but by the afternoon the 40+degree Fahrenheit temperatures were making the snow mushy. I even took my skis in for a wax, but still it wasn't a pleasant skiing experience. So we didn't stay until the end of the day. Overall it was a good time, and we'd like to go back. They have a spring ski pass for $129, so if you can ski multiple days in a row in the spring, it's a super deal. Since we got done early, we had extra time. I asked the kids what they wanted to do, and they said go to Hogle Zoo. It had been years since our last visit, and I went fully expecting crowds. But apparently going late on a Thursday afternoon is a good time. It wasn't that crowded, and we could see the animals easily, even The Thinker. 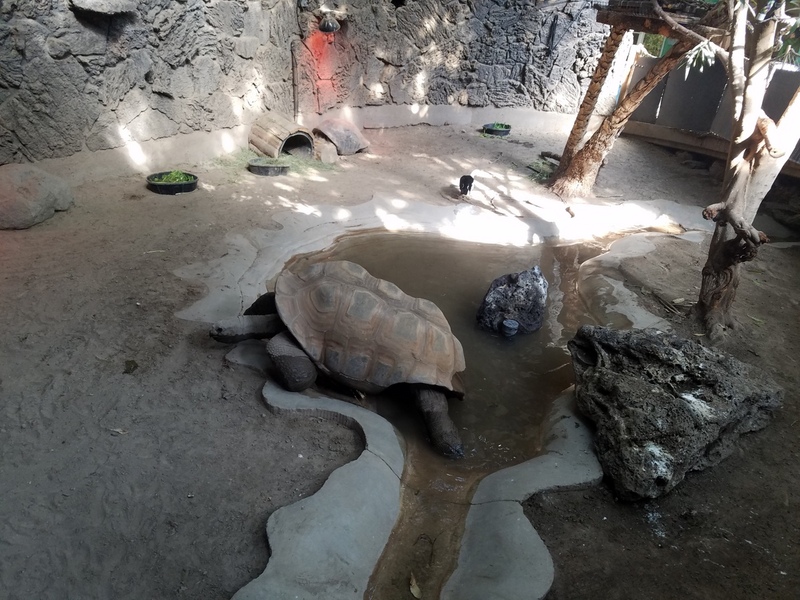 We all agreed that our favorite animal was this giant tortoise in the small animal and reptile house. Can you tell what this is? 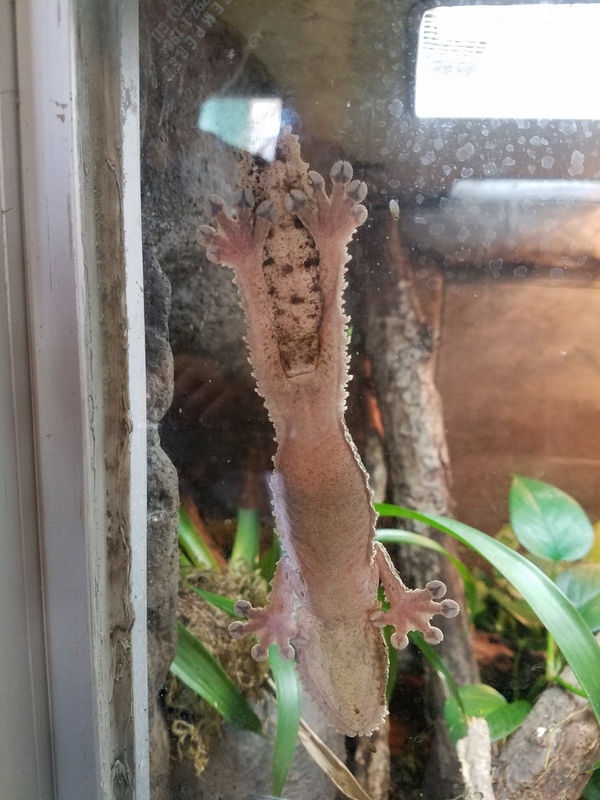 It's a gecko! Well, we found the tortoise had moved. It apparently wanted to get a drink of water. So it got on top of a rock. Then it very slowly made its way down to the water. The suspense about killed us. Would it bellyflop in? Tortoises aren't so graceful. Then we watched it lumber out. Finally it was almost back to its starting point. What a workout! 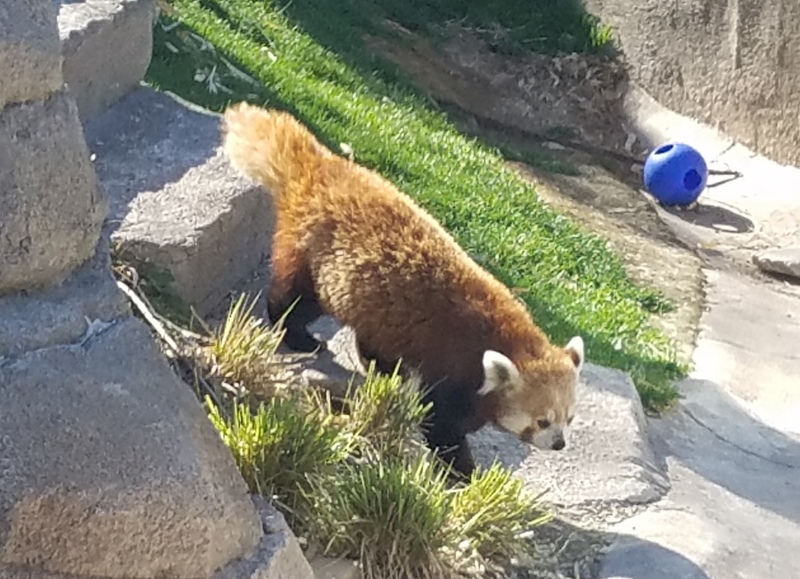 The kids were also excited to see the red panda, which they gleefully informed me was not in the panda family, but a different family. 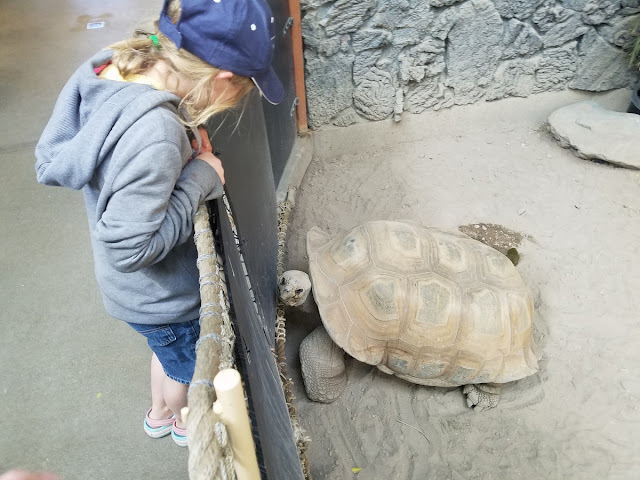 The late afternoon visit to Hogle Zoo was pleasant for all of us. 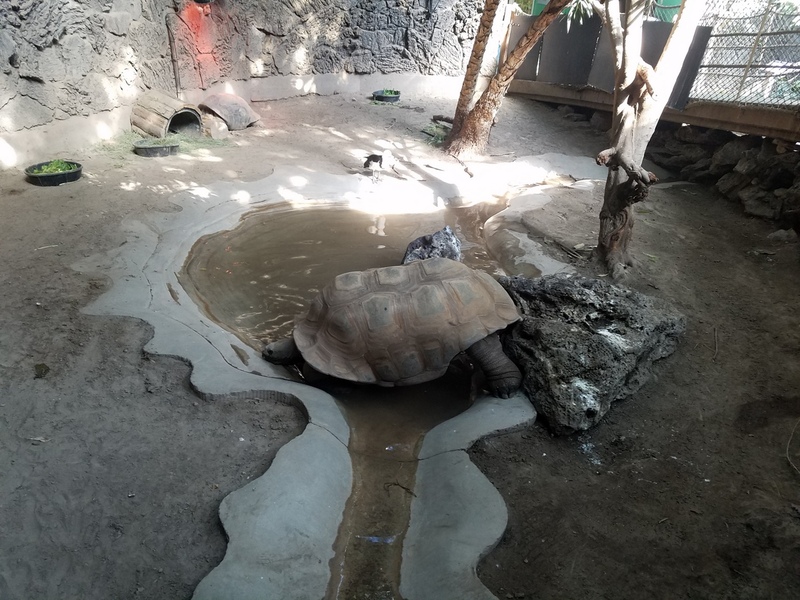 It's still winter season (until April 30), so regular admission is $16.95(adults)/$12.95(kids). More than what I would have paid for a two-hour quick trip, so again glad to have the Connect Pass. Next we did some quick shopping at thrift stores, finding some great items for all of us. Goodwill is my favorite, as they have half off a certain color tag each week, which gives you super good deals. 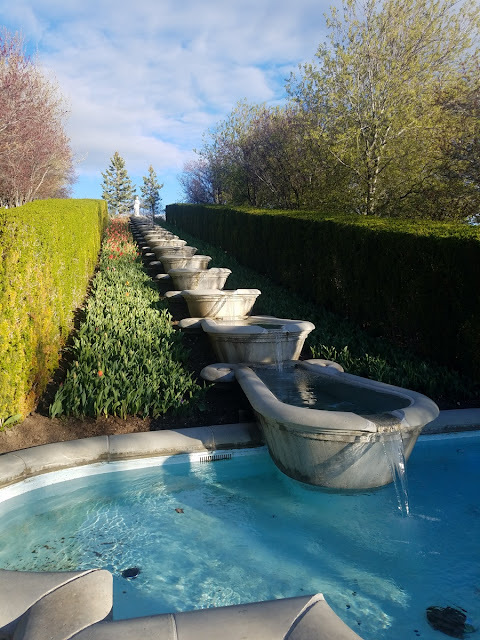 The next morning was my turn to pick what I wanted to see from the Connect Pass line up, and I chose the Utah Museum of Fine Arts. We had never been there before. 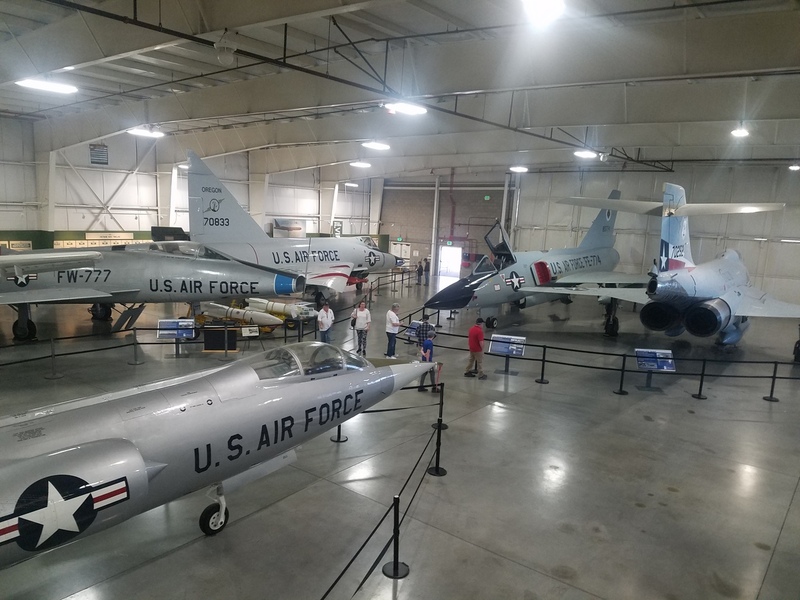 It's on the University of Utah campus, and I wasn't sure what the parking situation would be, but they have free designated spots for museum visitors. When we entered, they offered us a selection of family backpacks to check out. 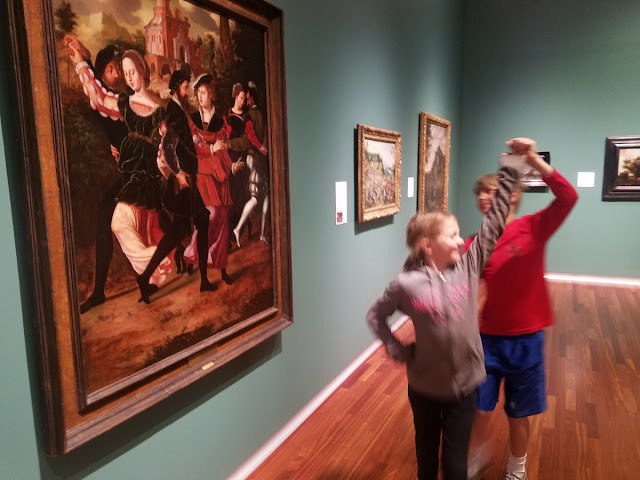 The kids chose the Egypt one, and we headed to that exhibit. 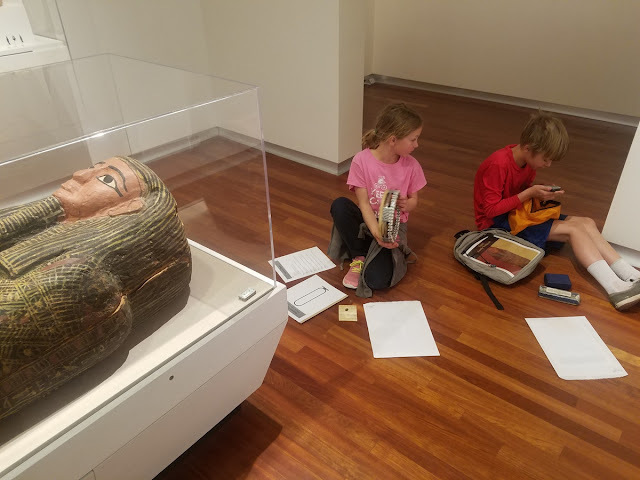 The Egypt exhibit is just in one small room, but the backpack had us examine everything closely. Desert Girl and I really enjoyed it. Desert Boy didn't have quite as long an attention span. After we finished that backpack, Desert Girl asked if we could check out another. I was ecstatic that she was so engaged. 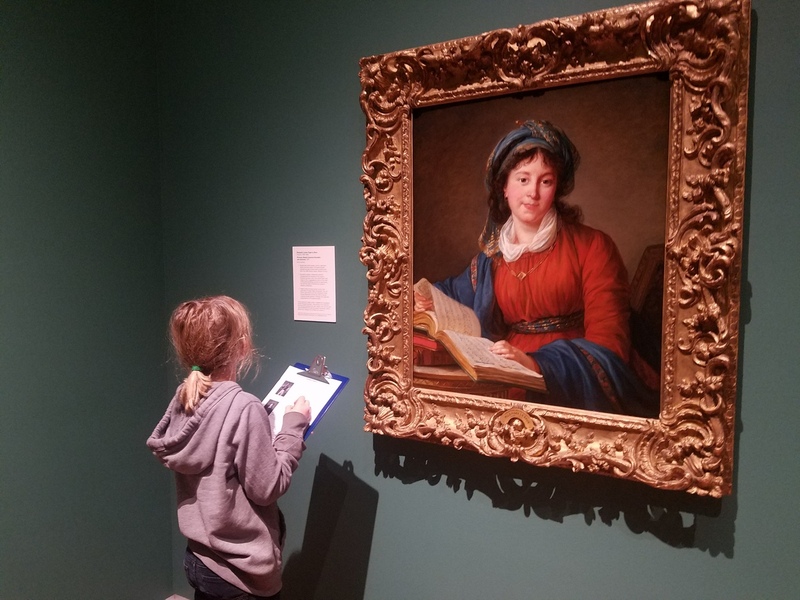 She chose European and learned about landscapes, still lifes, and portraits. Here she is with her own still life arrangement. The kids had some fun imitating the paintings. Desert Girl loves Mad Libs, so she was delighted to have a Mad Lib activity with portraits. They turned out quite funny. It was approaching lunch time, so we finished looking at exhibits on the second floor, wanting to spend more time in Oceania and Africa. But our stomachs called to us, so we ate tasty food from the Museum Cafe. 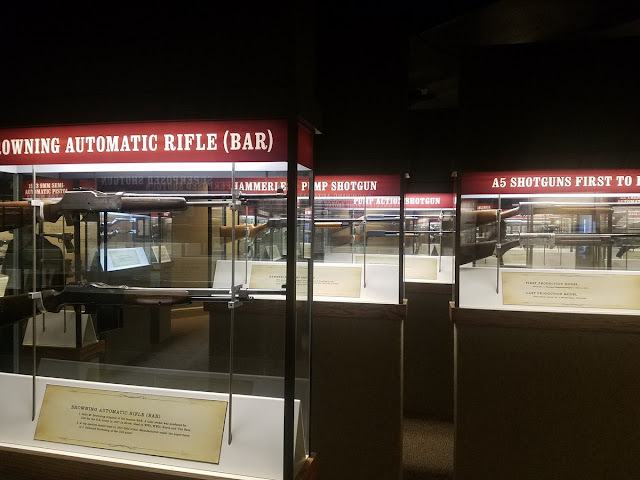 Then we looked at the first floor exhibits. The highlight was The Race to Promontory: The Transcontinental Railroad and the American West. We looked at a variety of photographs taken as the steel rails were laid across the country. 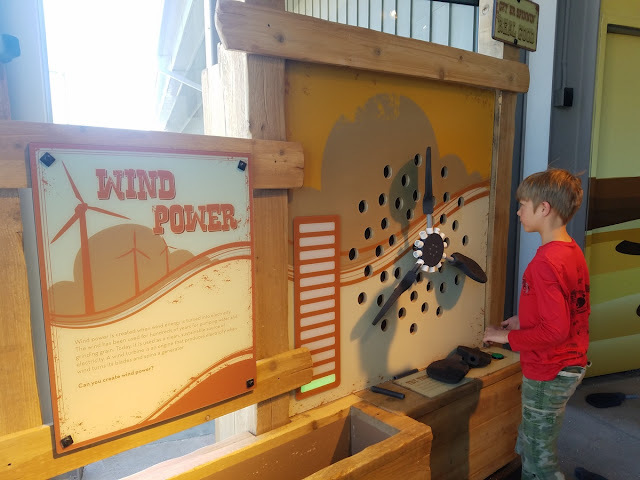 The center of the display were the three spikes. Originally there were four, but one is lost to history. 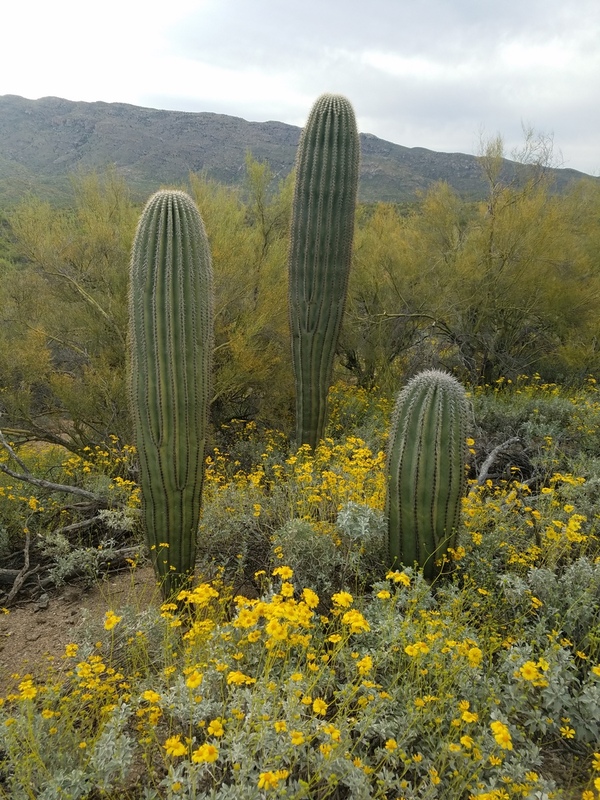 Now there's just one golden one, the Nevada silver one, and the Arizonan gold, silver, and steel spike. 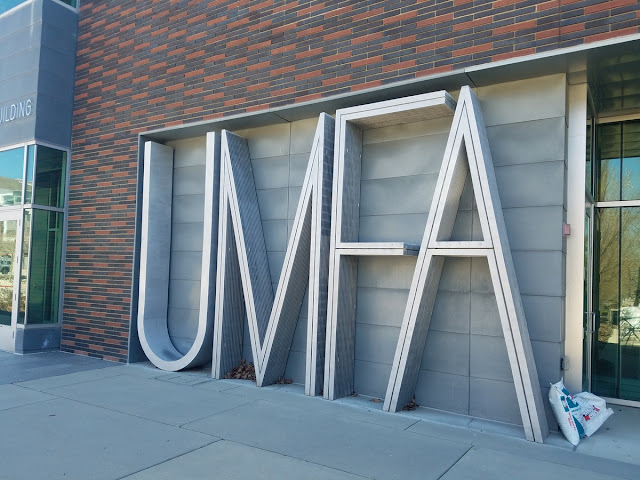 Regular admission to the UFMA is $17.95(adult)/$14.95(kids). There's enough to do to spend a whole day (especially if you use the family backpacks), so this is one place I probably would have paid full admission. Or tried to go to on a Wednesday, when they have special deals. It's also included with the Connect Pass. 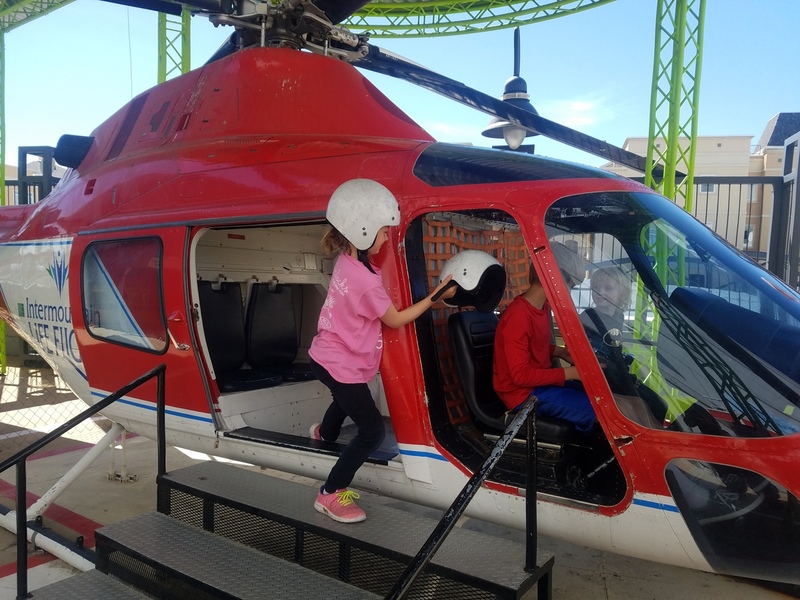 Next up was kids' choice, and they wanted to go to Discover Gateway Children's Museum. 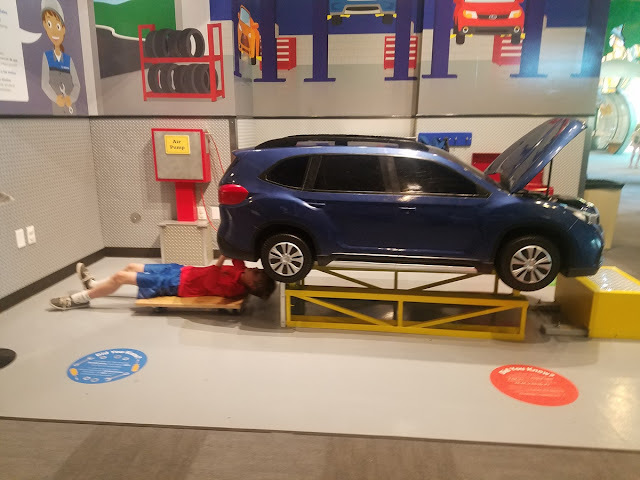 I'm not the biggest fan of children's museums, but we went anyway. 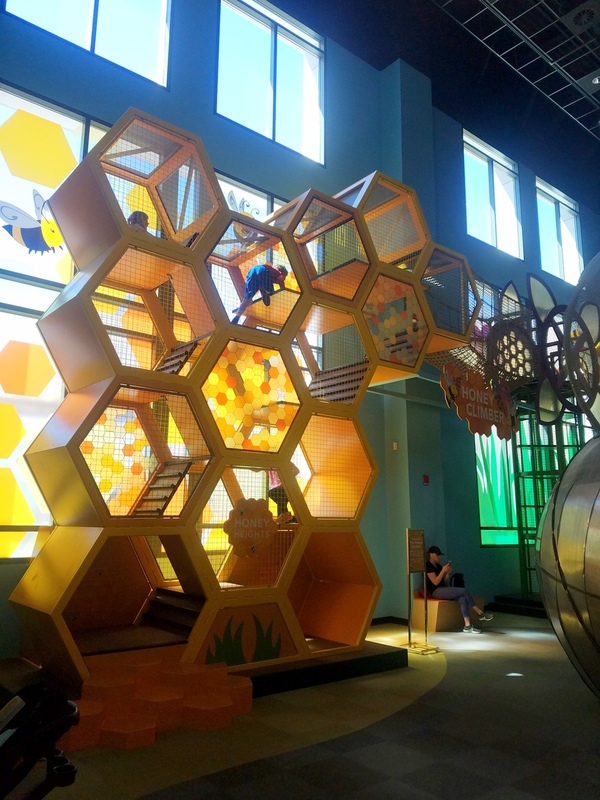 The kids immediately climbed into the beehive. In the little town, they tried their hand at various jobs. 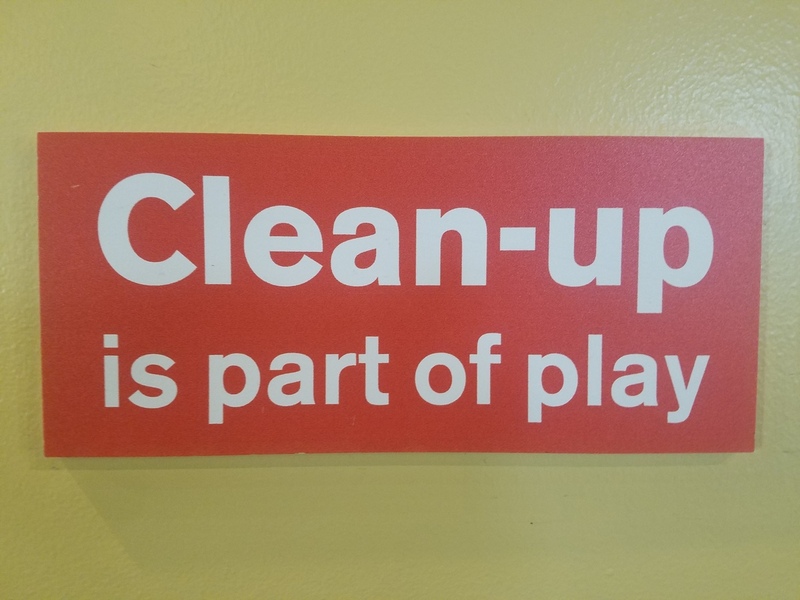 Not too many kids or parents heeded this sign. The favorite part for the kids was the Intermountain Life Flight helicopter, where they had roles as pilot, co-pilot, nurse, paramedic, hoist operator, air traffic controller, and more. Later we met a pilot who had logged 1500 hours in this helicopter. 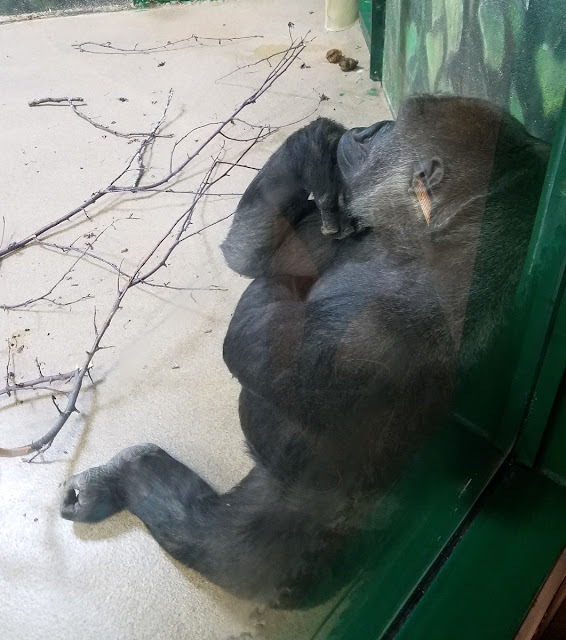 He told us the story of how it had ended up at the museum. One windy night it had landed at the hospital. The wind blew it to the side a little, and the tail rotor bumped something that blew up into the main rotor. No one got hurt, but it totaled the helicopter. Now it lives on in children's imaginations. The kids played contentedly for almost two hours and I got a short nap in. Regular price is $12.50 (adults and kids). We came after the school group of 99 kids, so it wasn't terribly busy. 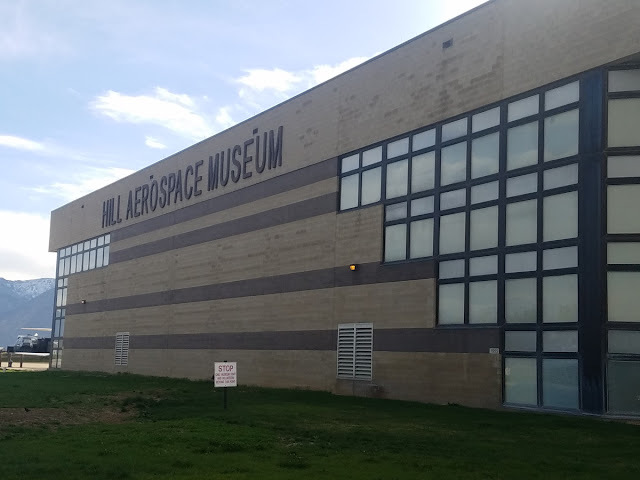 For our final day of museums, we headed north, to the Hill Aerospace Museum. We had been before and wanted to go again. 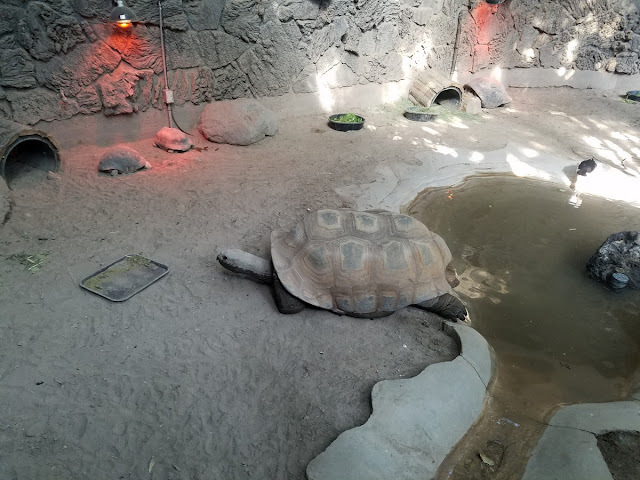 We got there half an hour before opening time, which gave us time to wander the outdoor exhibits and have them to ourselves. Then we headed inside to the giant two hangars, which are packed with planes, helicopters, exhibits, and more. I always find it a little overwhelming, there is just so much! But Desert Boy and my husband (who joined us for this day) really geeked out. They know their planes. Best part: admission is FREE! 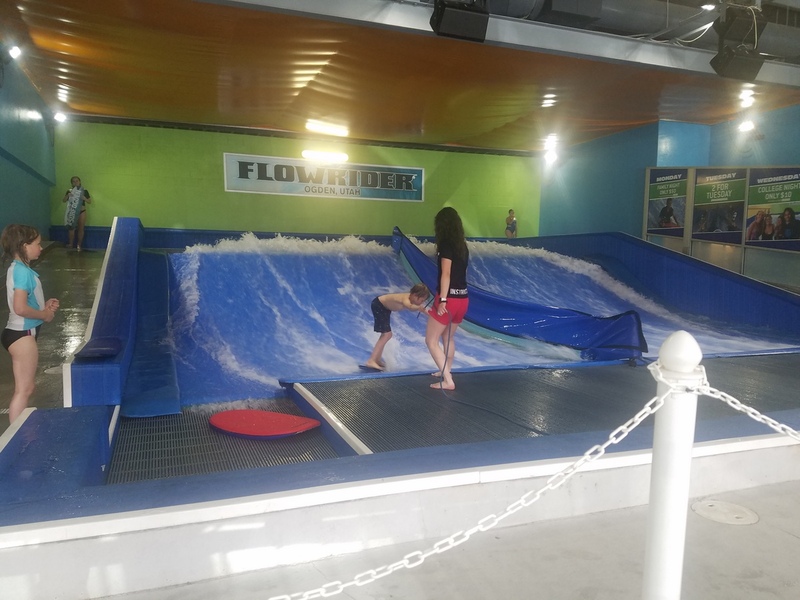 The price is very reasonable, $7(adults)/$3(kids)/$20(up to 2 adults and 6 kids). The Browning Firearms Museum has lots of guns on display. 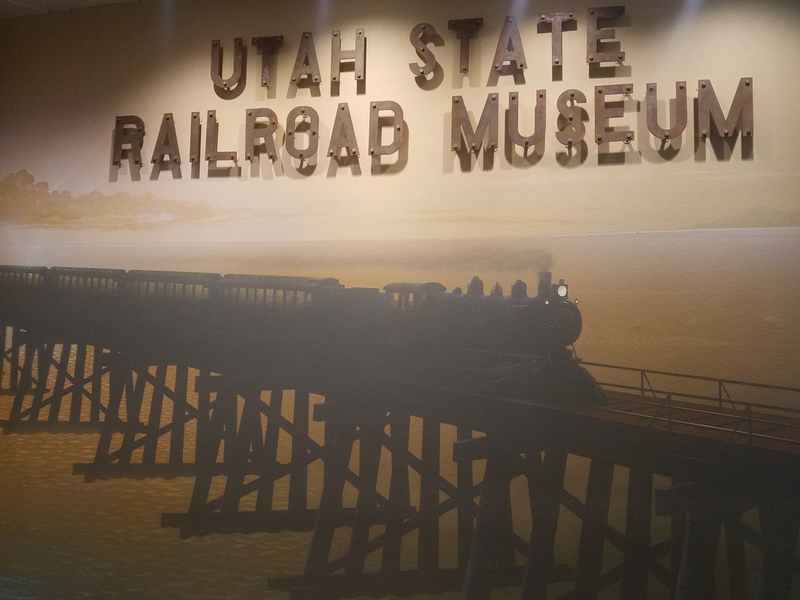 The Utah State Railroad Museum is nearby. 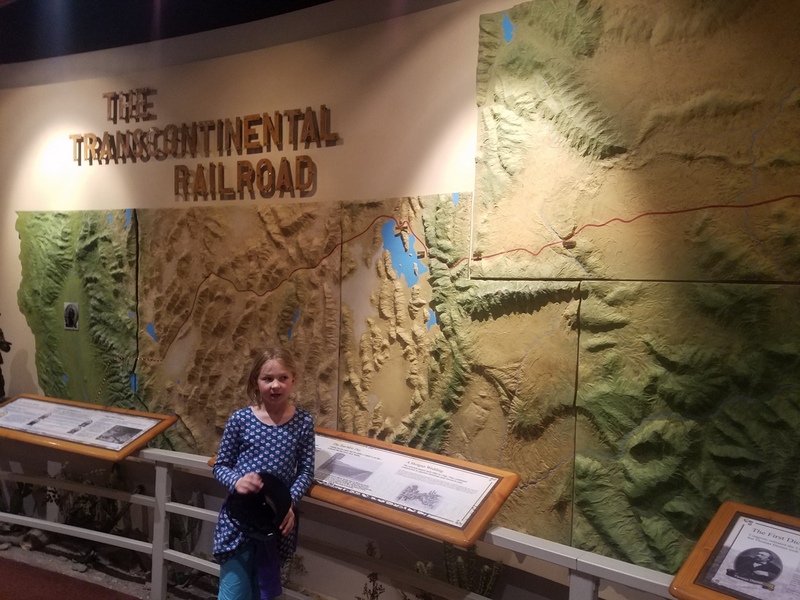 It reinforced what we had learned at the UFMA about the Transcontinental Railroad. Desert Girl couldn't resist posing like a conductor. 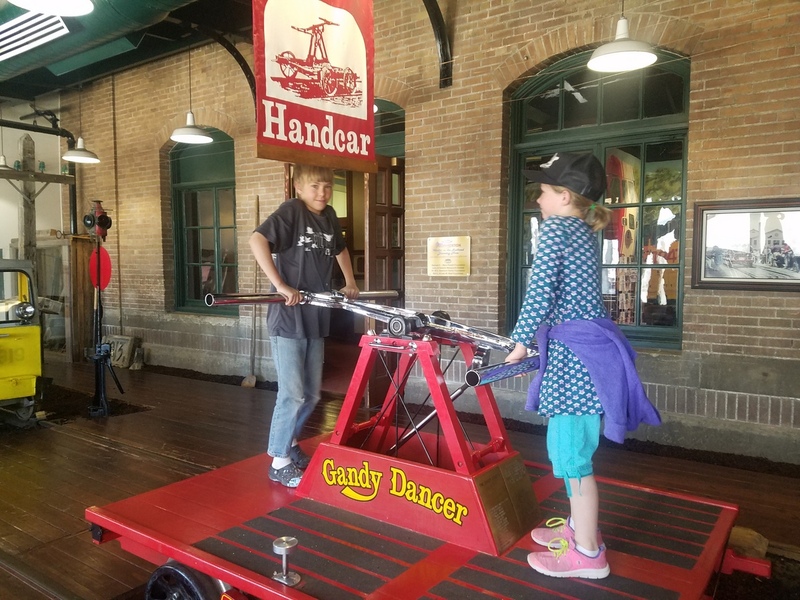 We could get on the Handcar, but it didn't move down the tracks. 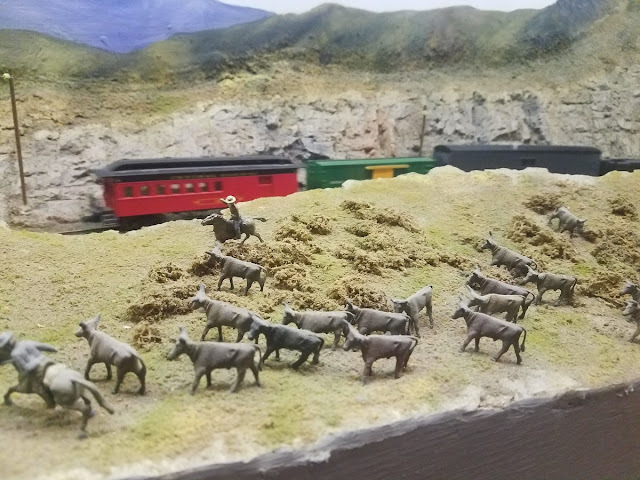 They also had a huge model train display, with multiple HO-scale trains going through a variety of Utah's landscapes. It was so fun to watch. 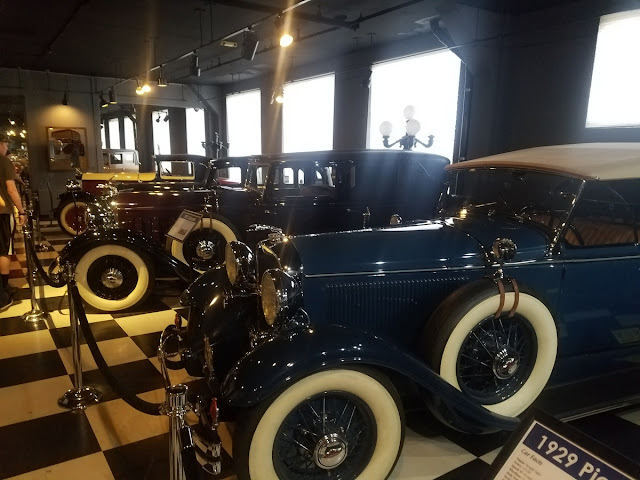 The Classic Car museum is small but has some real beauties. 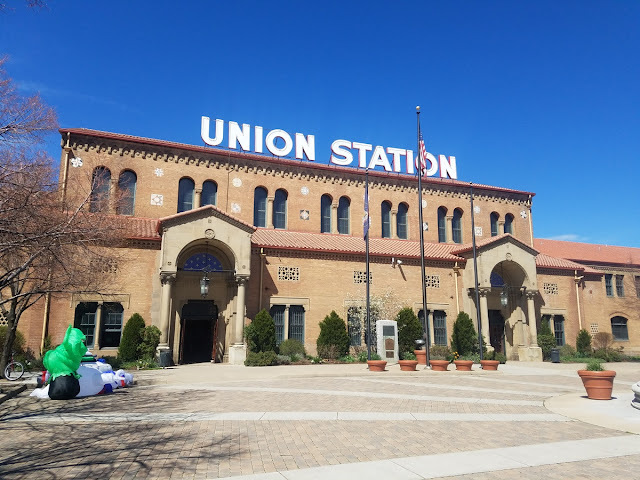 Union Station was great. 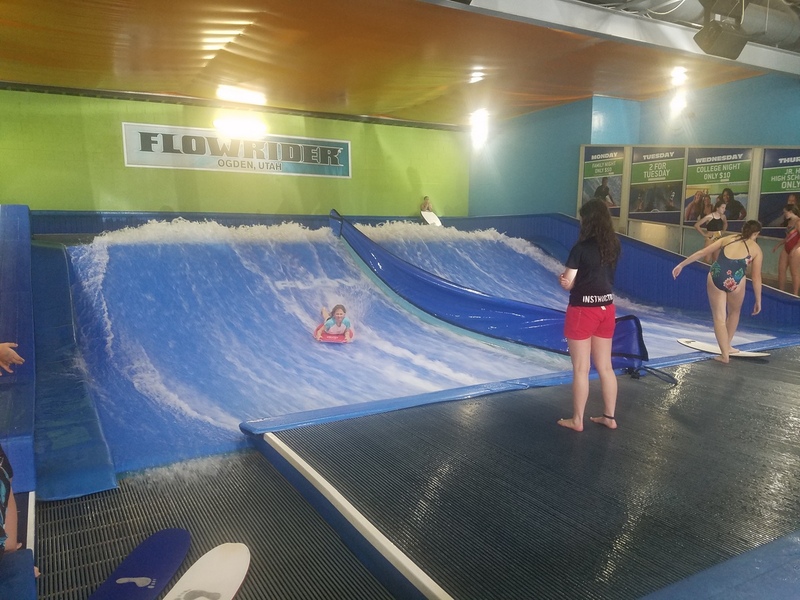 While researching the trip, I saw there was the possibility to take a surfing lesson in Ogden, so the kids gave that a try for an hour at Flowrider. Desert Girl stayed on the Boogie Board. Desert Boy gave surfing a couple tries, but fell hard. They both ended up with bruises but would like to do it again. 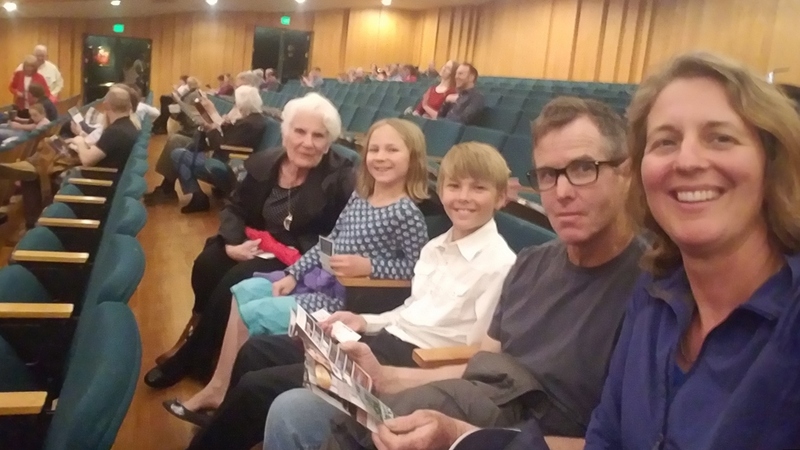 Our final activity was to attend the Utah Symphony. We've done this a couple times before and really, really enjoy it. We were fortunate to be able to include a family friend for this outing. 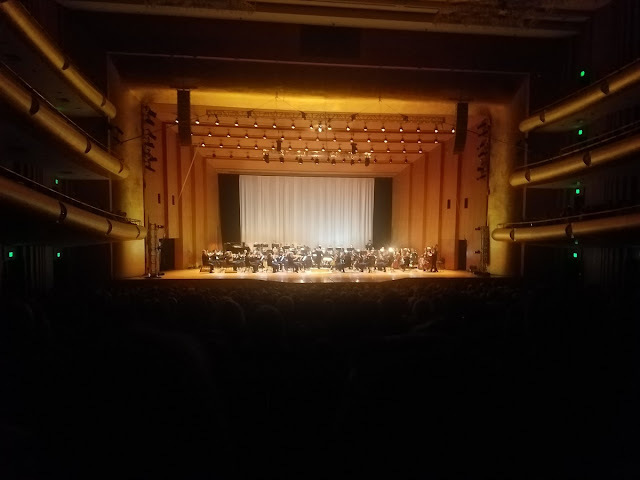 The performance was not only the Utah Symphony, but also Troupe Vertigo, circus dancers-aerialists who performed a variety of stunts, many of them up in the air. It was amazing (and scary at times). Students under age 30 can get tickets for just $15. I've also gotten great deals on Black Friday. And check out their Family Pass, with just $30 for a family of 4 to attend. 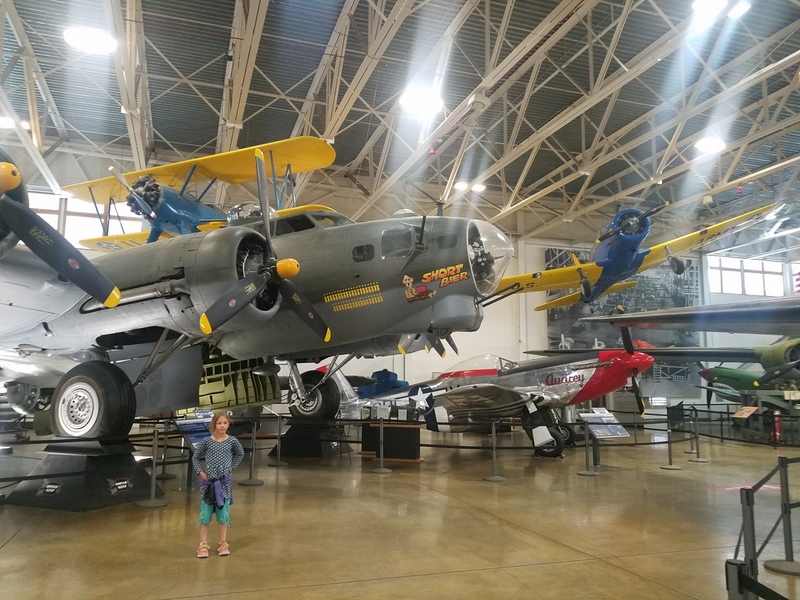 The kids and I rated everything that we went to. What was the big winner? 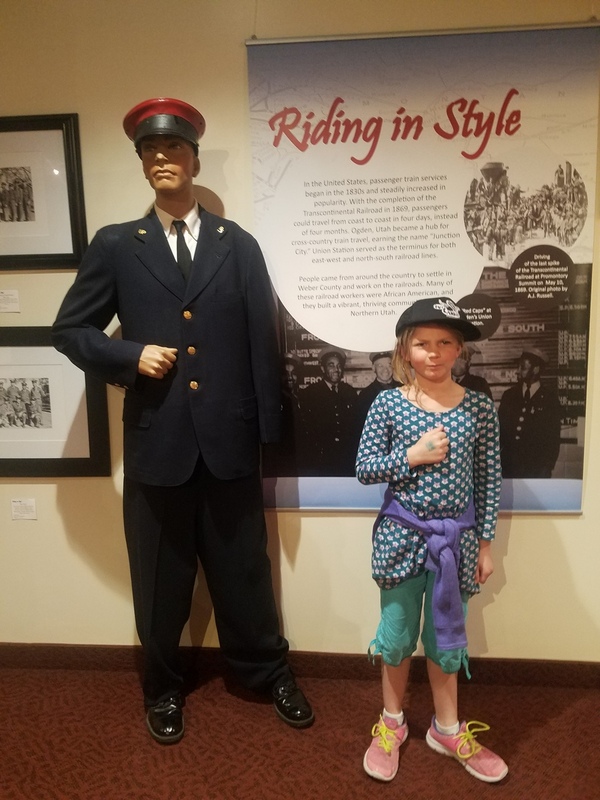 Second was the Utah State Railroad Museum. We still have lots more left to do on the Connect Pass, so we'll be back to try out more activities! With the 5 places we went to, the adult price would have been over $92. With the Groupon, I paid $86.50, so already it's been worth it. And we still have 11 more places to go! Woohoo! 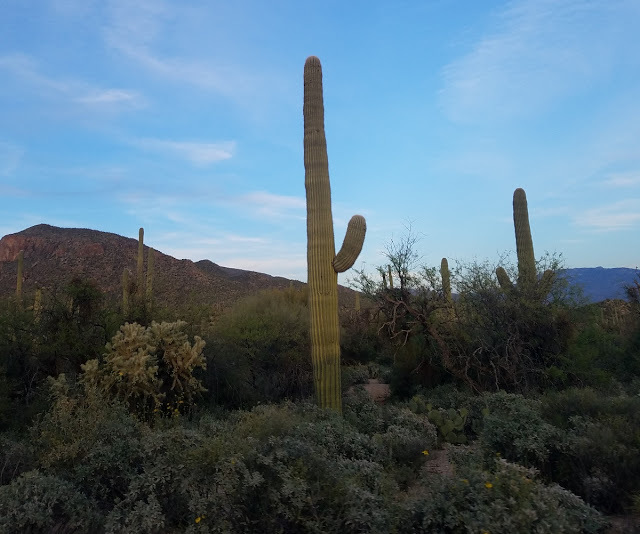 I haven't spent much time in the Sonoran Desert, so when I had an opportunity to visit recently, I was very excited. 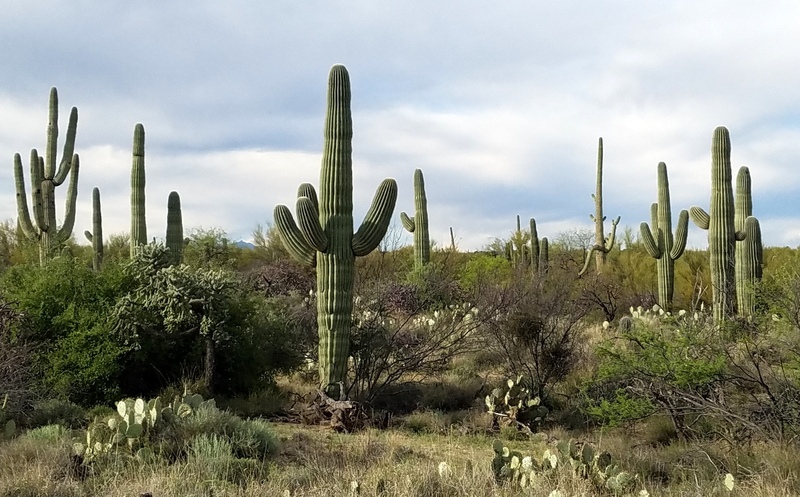 The Sonoran Desert is home to the iconic saguaro cactus and over 2,000 species of plants. 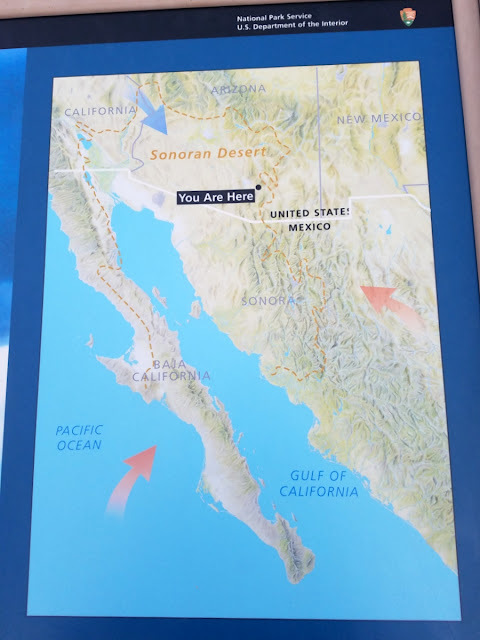 The Sonoran Desert includes the state of Sonora in Mexico plus part of Baja California, as well as a tiny bit of southern California and a fair portion of southern Arizona. 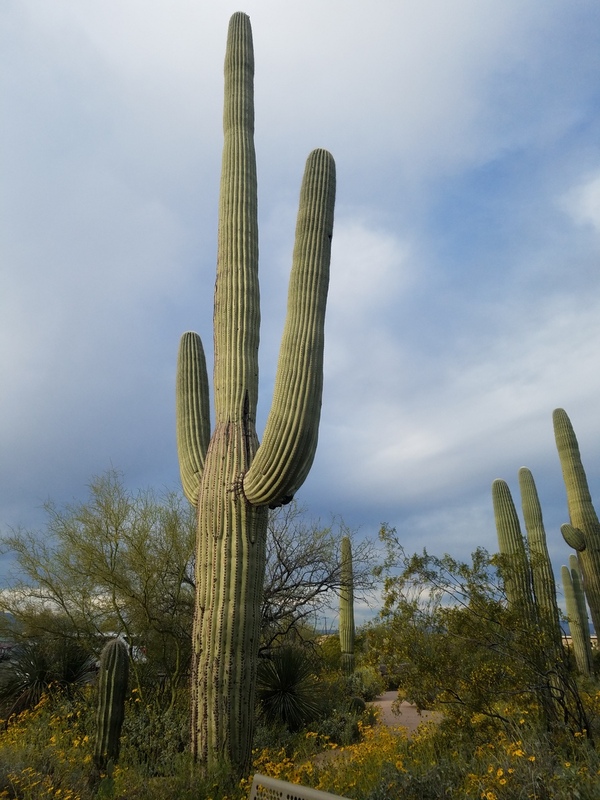 Tucson, Arizona is a great place to see saguaro cacti. My friend Sarah asked if I would help teach a cave rescue class one evening while I was there, and I happily agreed. 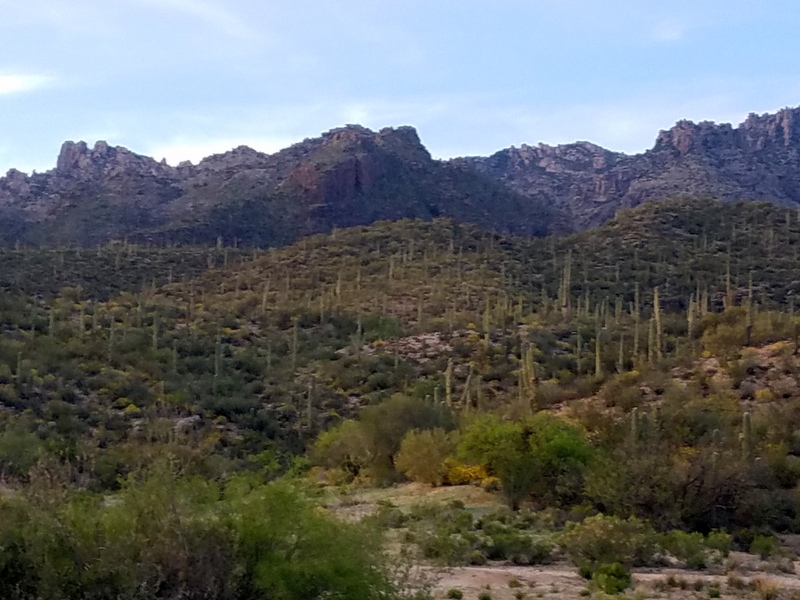 My eyes bugged out as we approached the training facility: the hillsides were covered with saguaro. It was for the Southern Arizona Rescue Association. 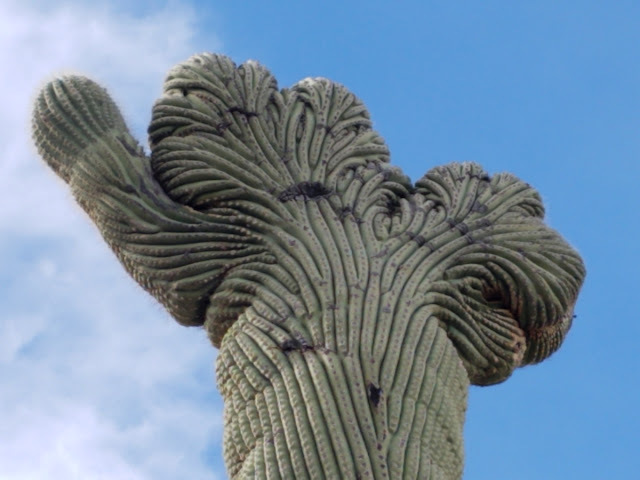 I like that they have saguaro on their logo. 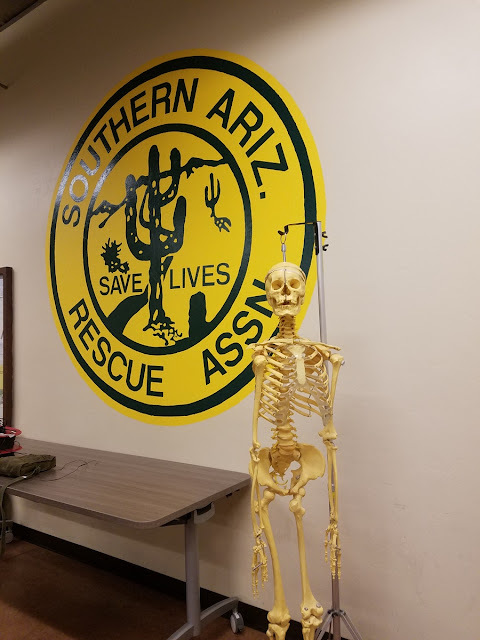 And I just had to snap a photo with the juxtaposition of a skeleton and "save lives" in the same frame. 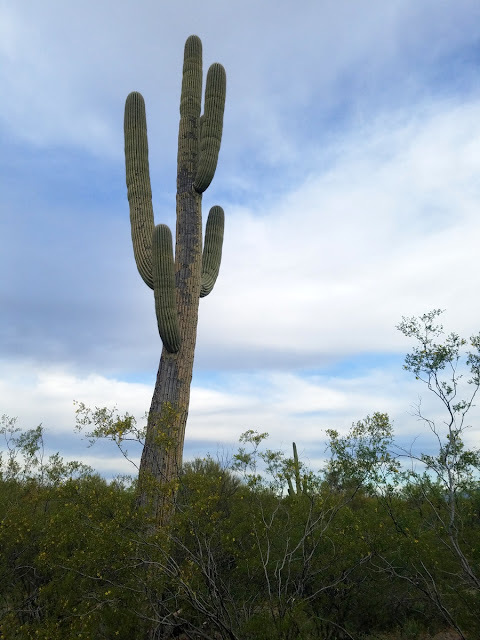 I woke up early my last day, and before I went to the airport, I went to Saguaro National Park. They have a west unit and an east unit. I entered the east unit at opening time, 7 am. I was promptly wowed by the expanse of beautiful flowers, tall cacti, and shrubby trees. 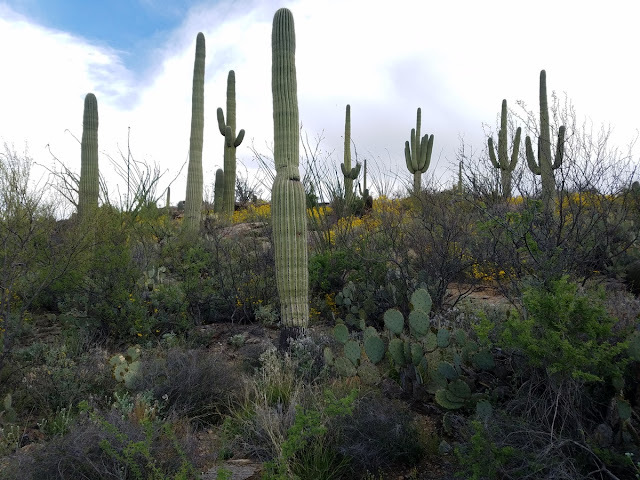 I quickly learned that there used to be a lot more cacti in this area, but due to prolonged freezing temperatures many years ago, the cactus forest had shrunk. 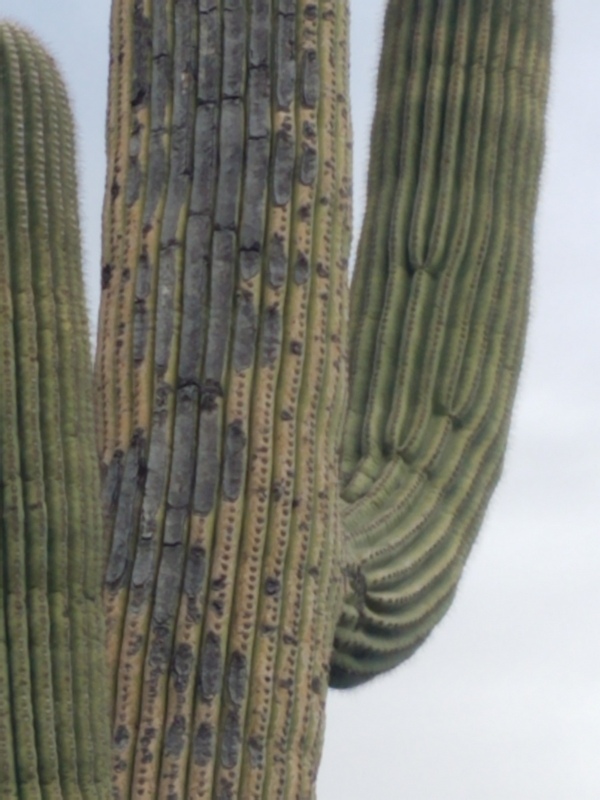 This particular cacti looked a little worse for the wear. 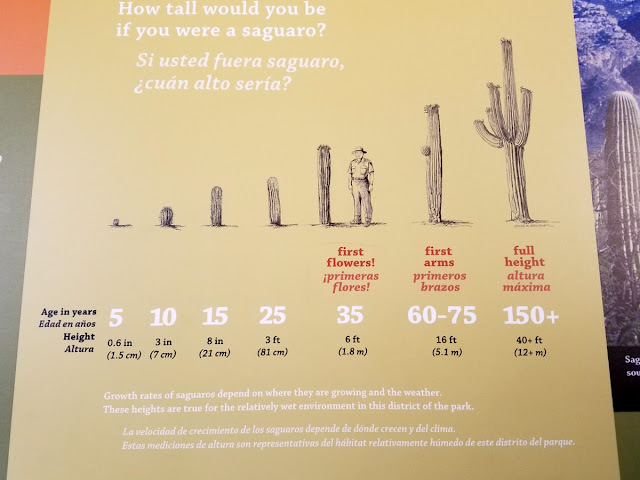 There's so much I have to learn about saguaro biology! For this trip, my goal was just to enjoy the company of saguaros and the surrounding vegetation. 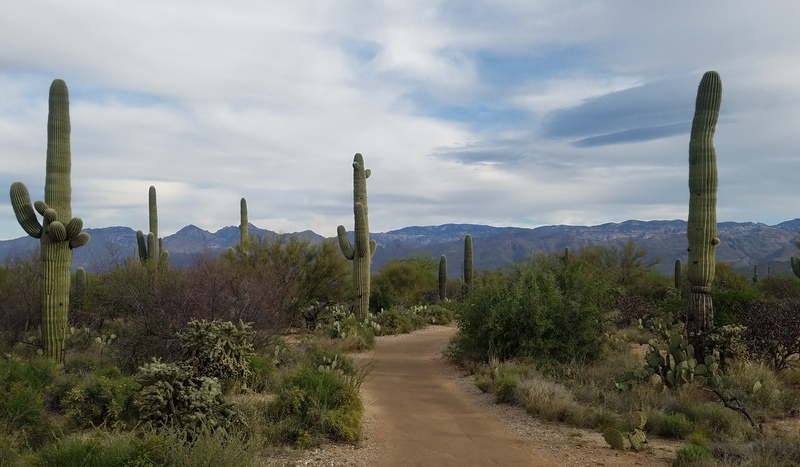 A network of trails makes it easy to do that. 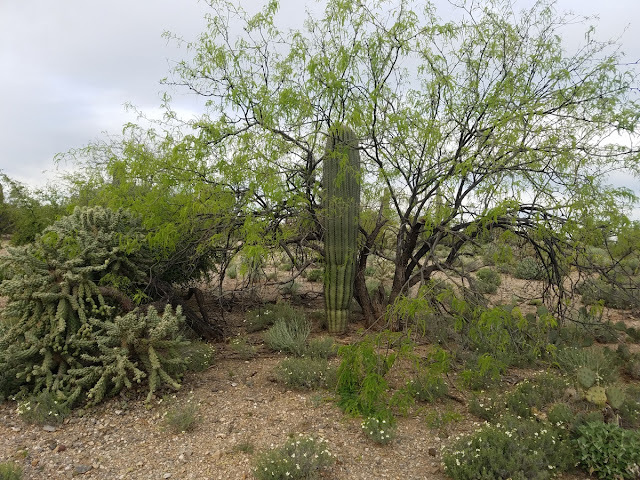 I learned that many saguaro grow next to nurse trees, which protect them from wind and heat and help them get extra nutrients. Palo verde is one of the most common trees. Saguaro cacti aren't the only cacti around here. 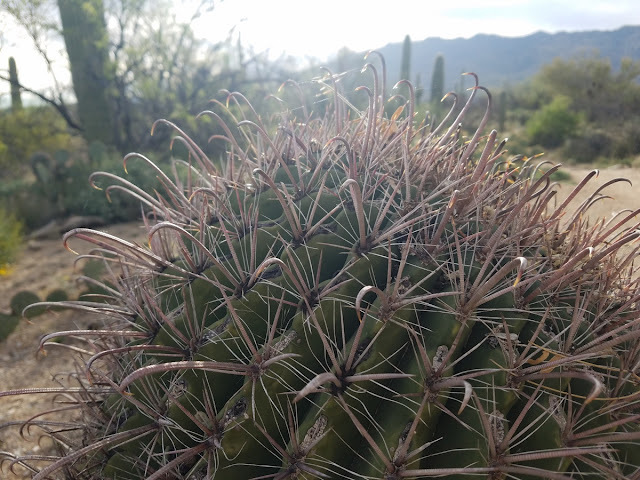 Here is a barrel cactus, possibly a fishhook one. At least the spines resemble fish hooks! The mixture of prickly pear, cholla, and saguaro of various shapes made me smile. This saguaro had a bunch of holes in it, which birds will use for nesting. 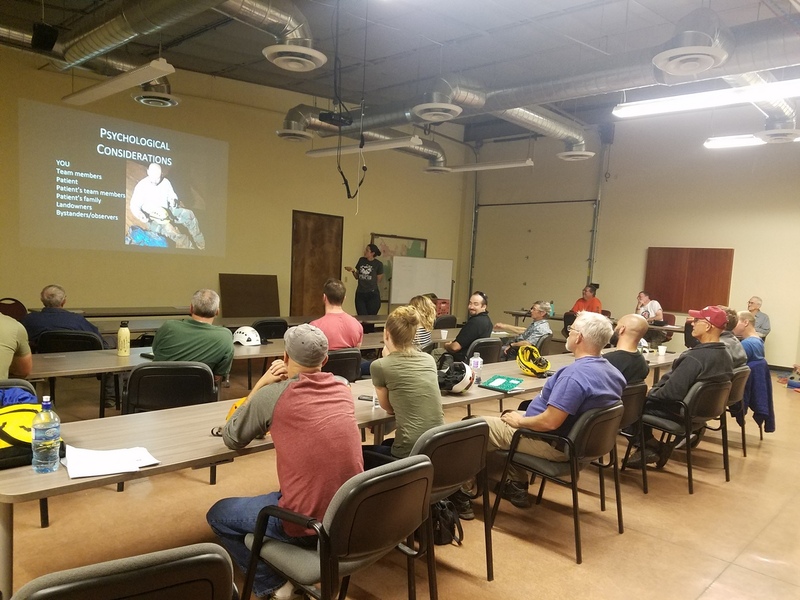 If you don't have tall trees, you learn to adapt! This is a crested saguaro. Not many of them take this form, but it sure is eye-catching. I didn't have time to hike far, but I went a short way on several trails just to get a taste of them. 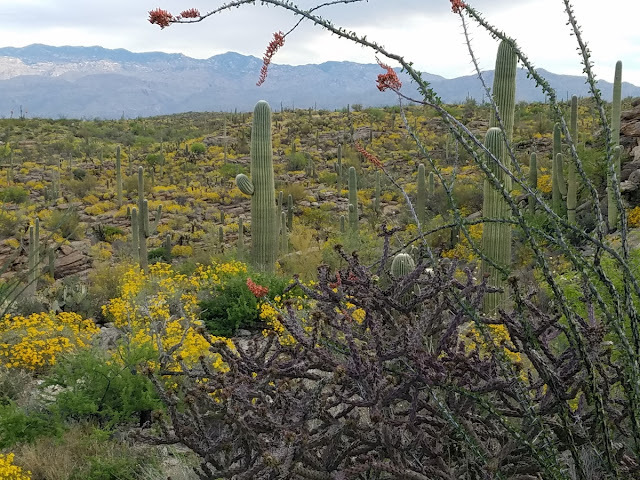 On this rocky trail I found ocotillo blooming, a different kind of cholla (there are several kinds in the park), and a carpet of yellow wildflowers. I took so many photos! I'm just sharing the best here, as a teaser to go explore more. 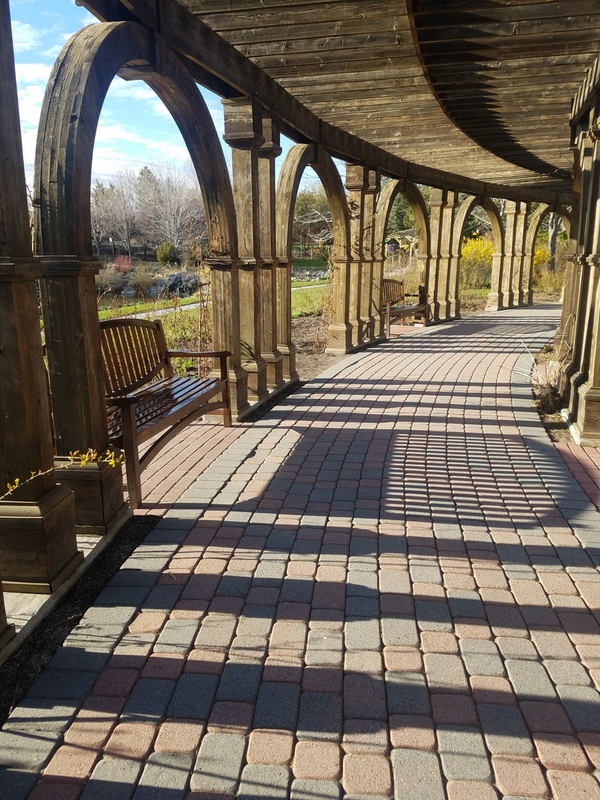 I couldn't stay long, and my time in the park was over long before I wanted it to be. This sign was in the visitor center, and I found it really cool. 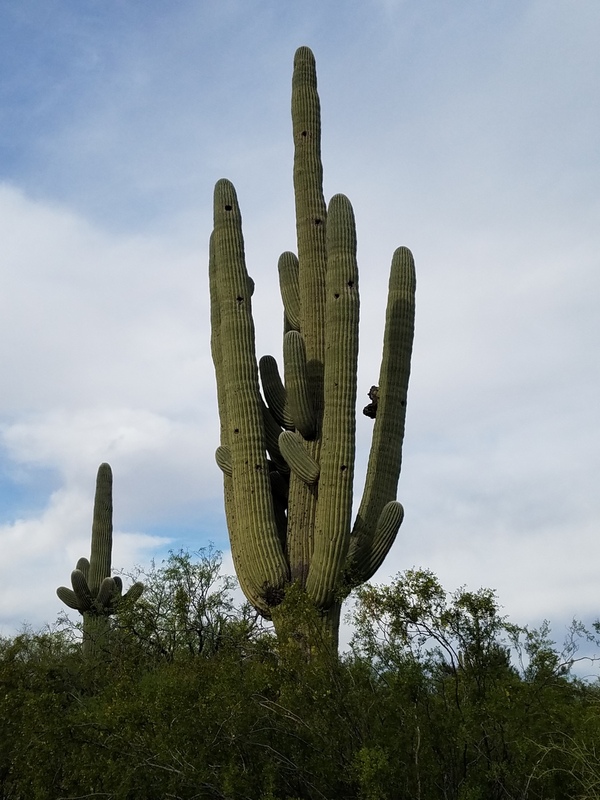 These saguaro are long-living! I'd like to make Tucson a family destination, there is just so much to see and do in the nearby area, including Saguaro National Park, the Arizona-Sonora Desert Museum, Pima Air and Space Museum, Kartchner Caverns, and much more. Have you been to this area? Do you have any suggestions?